Join thousands of Aussies changing the lives of winemakers. A FREE premium bottle every month when you order a case. 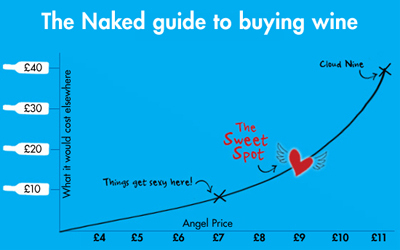 ANGEL only prices (25-50% less). Access to Angel EXCLUSIVE wines. Invitations to EXCLUSIVE tasting events. Angels get FREE next day delivery to Sydney Metro*. Check your postcode here. Let us know about wines you've already tasted, and get personal recommendations based on your feedback. This is the only Botrytis Semillon dessert wine available through Naked Wines! Rob has hand crafted a unique wine for Angels with grapes from the NSW Riverina region. Wines of this style are quite rare not only in the landscape of Australian wine, but also in world wine. Your glass will show wonderful colours of light gold with amber hues. Then get ready for some enticing aromas. Think dried apricot and orange marmalade combined with fresh peach and hints of high quality French oak. The scrumptious flavours on your palate will be a rich and complex combination of mango and citrus layers. The fine acid structure combined with subtle oak characters provide balance to this exceptionally complex and luscious wine. Rob's outstanding attention to detail has created a sweet delight that is a true reward for the Angels who helped make it happen. This is the perfect wine to enjoy with special company, save for an occasion or to share as an out-of-the-ordinary gift to a lucky pal. So, why not stock up with several! 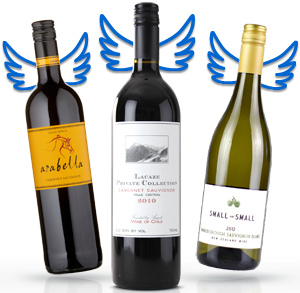 Combining the strengths of two pristine NSW winemaking regions, Rob brings Angels a huge treat. At under $12 Angel price, a Chardonnay packed with this much quality is a steal! You'll lap up classic aromas of peach and nectarine, combined with fresh melon characters and hints of cashew nuts. Stone fruit and citrus flavours will coat your palate, followed by the subtle oak that adds complexity to this captivatingly curvaceous drop! The Riverina fruit component is responsible for providing the wine's intense core of fruit - peach, nectarine, melon and citrus flavours. The cool climate Tumbarumba component provides the fresh acidity, structure, and more subtle aromas of fresh green apple and ripe fig. Together they produce a richly textured and elegant wine with balance and complexity. Rob was able to hone his craft while working several vintages in Burgundy, France, so since that time focusing on premium Chardonnay, the varietal has remained a huge source of pride and inspiration for this young Naked superstar. This wine is drinking beautifully as a young, vibrant Chardonnay. Like any young thing, it's versatile so go ahead and try with your favourite meals! Rob’s juicy Vermentino is the perfect wine for the hot months to come. The zesty, tropical fruit flavours are complemented beautifully by zippy acidity and leads on to a super refreshing long finish. You’ll discover enticing aromas of floral jasmine and lemongrass all combined with a fresh limey zesty hint of tropical flavours. This burgeoning white variety is a foodies best friend! Your taste buds will be dancing in anticipation of the next sip. This is sure to become another classic that flies off the shelfs in a jiffy! Get ready for a crunchy, dry and fresh mouthfeel that make this drop not only the perfect food wine, but also wonderful to enjoy on its own. Textbook pear, citrus blossom and fresh apple aromas sing out, all the crisp and lively characters that make Italian whites so enjoyable! Pinot Grigio is a hugely popular Italian varietal found traditionally in the North Eastern regions of Lombardy, Alto Adige, Friuli-Venezia and right where Rob's family came from, the Veneto! The sunny Mediterranean style climate of Rob's Aussie home region the Riverina provides the ideal conditions for growing Italian grape varietals. It's hard to find a guy more passionate about NSW wine than Rob, and you’d be hard pressed to find a wine more food friendly than this! Blending portions of both warm and cool climate fruit gives the best of both worlds - fruit forward balanced with structure that will age. What's not to love - a little slice of Italy delivered to your door for under $12! The inspiration for this wine comes from Rob's time working in Marlborough, NZ. The grapes for this refreshing drop were sourced from Rob's home region of Riverina as well as the cool climate region of Orange. After a gentle crush and press, only the best free-run juice was used to create this silkuy smooth drop! Vibrant aromas of passionfruit, guava and fresh cut snow peas dance around each glass poured. 2018 conditions delivered an outstanding parcel of fruit to the winery. From here, Rob's professional guidance has resulted in a wine that showcases the varietal's natural delicious tendencies. All this is quality at an incredible Angel price - under $12! The palate is crisp, dry and zingy, exhibiting layers of tropical and citrus flavours. Fresh acidity combined with pristine fruit flavours provide finely tuned balance to each sip. Definitely a wine to stock up on while you can..Angels jump at this wine each year so don't be left high and dry waiting for the next vintage! To make sure we know which wines are available to you we need to know which state you’re in. Licence Number LIQP770016426 • Under the Liquor Act 2007 it is against the law to sell or supply alcohol to, or to obtain alcohol on behalf of, a person under the age of 18 years. * Next day delivery to Sydney Metro applies to all orders placed before 3pm on a weekday. Use our delivery calculator to find out more. Enter your postcode and pick your suburb to see how much freight costs and how long delivery will take. Costs too high to your house? We're really sorry, but we are working hard to bring it down. Join this group and be the first to hear when we've got you a better deal. Sorry, we don&apos;t deliver to your postcode. How do I pay this price???? Put your name on the Angel waiting list today and we&apos;ll get busy finding the next Naked winemaker. And when we do, you&apos;ll get your wings. By spending $8-$10 for a bottle of wine, you're actually getting more than DOUBLE the quality of wine than a $6-$7 bottle …pretty impressive huh?